EDITOR'S NOTE: This is a new series of posts called FIRST LOOK featuring excerpts from stories. We hope you enjoy them! Obadiah has the most broken heart in all the land. 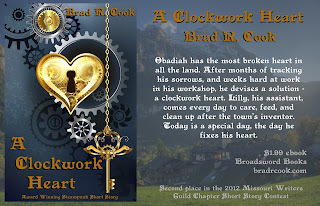 After months of tracking his sorrows, and weeks hard at work in his workshop, he devises a solution – a clockwork heart. Lilly, his assistant, comes every day to care, feed, and clean up after the town’s inventor. Today is a special day, the day he fixes his heart. A Clockwork Heart is available on Amazon. Brad R. Cook is the author of The Iron Chronicles, a y/a steampunk trilogy, and a regular contributor to The Writers’ Lens. He began as a playwright, then dipped into the corporate writing world before moving into the publishing world. A member of the Society of Children’s Book Writers and Illustrators, he currently serves as Historian of St. Louis Writers Guild after three and half years as its President. He can be heard weekly, as a panelist on Write Pack Radio. He learned to fence at thirteen, and never set down his sword, but prefers to curl up with his cat and a centuries’ old classic. Bradrcook.com @bradrcook on Twitter, Instagram, and tumblr. The Writers’ Lens is about "Bringing fiction into focus." What brings your writing into focus-- the characters, the stories, the love of words? 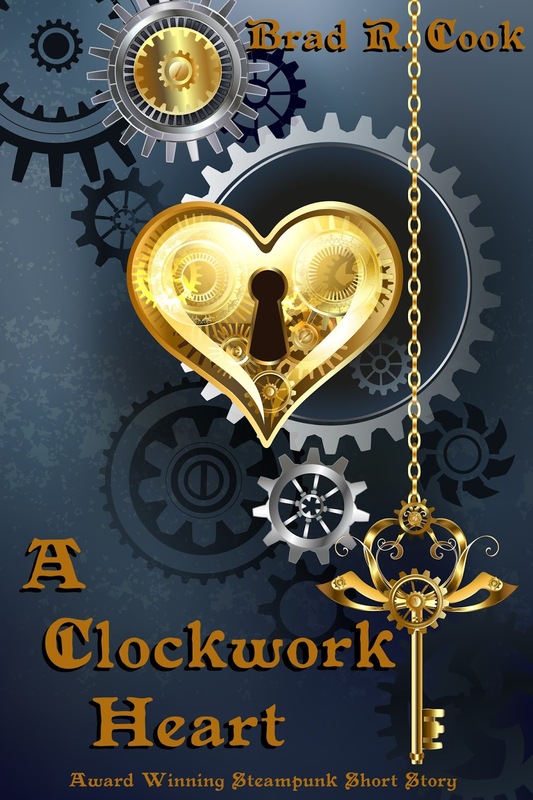 I’d have to say it depends upon the story, but for A Clockwork Heart it would have to be the story. I write young adult Victorian adventures, and this was such a departure from that. However, it’s still steampunk which is close to my heart. I wanted to write a love story… with a twist. It is fantasy, but I try to keep many of the historical elements. I do know that an artificial heart is much more complex than I have made it seem in this story, but that’s the fantasy. It is true that barbers used to be doctors. For this story the last line was easy. It almost wrote itself, but the first line has changed in every incarnation I’ve created. Opening lines are tough. I’m always thinking of how can I hook the reader in only a few words. Love. I wanted to write a steampunk love story. I always write adventures and I wanted to twist things up a bit. Obadiah’s heart had cracked, been repaired, and shattered again. Now the pieces lay in the bottom of his chest clinking together whenever he walked. The depths of this depression hadn’t been reached overnight, or even a couple months. It took years to reach this barren rock bottom. He tried to figure out where it began, and even created an intricate chart that spanned three walls of his workshop. Strings wrapped around push pins marked out all the connections of his life. How tragedies had strung themselves together in a linked chain. Small bits of parchment with notes scribbled in ink had been pinned to each point where the strings connected. Circled in white chalk were the biggest tragedies….